posting the challenge a little bit earlier today as i am off to CHA (a big trade show for scrapbooking and other artsy fun stuff...can't wait to catch up with friends and see cool new product! )...next sunday will be interesting as i will be teaching in paris...but i REALLY want to try and make/post my card there - how cool will that be?!! but it will depend on internet access! i just love feeling your excitement and passion for creating this simple piece of yourself every week, i love sharing in that with you - from all over the world! isn't it amazing the connections we can make with one another through our hobby? i can't wait to see what you do this week...i may not have a lot of time to comment, but please share your links as i know so many people are enjoying looking through all the links and getting inspired by each other! i have a 'thing' for peace signs. they just make me so happy to look at and are such a symbol of goodness and oneness. 1. paint your card with gesso and a layer or acrylic (you can skip the gesso if you sand the card instead. 2. fingerpaint blobs of vaseline/petroleum jelly onto the dried paint. gently paint another colour over the top. when the paint is dry, wipe with a paper towel and the vaseline slides away, revealing the base colour. use a wet wipe if you have any extra greasiness that need to be gone! Hi Emily, have a great time at CHA! I wish I could visit too :) I'm already thinking about the symbol that is me... As soon as the card is ready, I will post the link! See you and have fun! Enjoy your time at CHA! and next week your much more in the neighbourhood of our cold little country whem you are in Paris! Yay! Finnaly! I've been waiting for this since last Sunday-great theme! so happy to be doing this (and getting them photographed and posted) they are up on my blog!! thanks for the fabulous idea my dear! 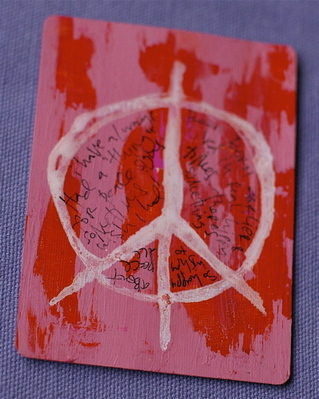 This peace-card is so beautyful and so YOU, Emily. Wish you all the best for this coming week, going to cha and to Paris. I just posted mine (I'm a week behind)! owmy how cool,have to try this girl! !Thanks for the inspiration!! Have fun at CHA - I'm going on Tuesday, I'm SO excited! Wish I was jetting off to Paris at the end of the week - what fun! I finally got my first journal card made, took me a while to get it together, it's posted at my blog. I have done the first 3 - will have to get my thinking cap on for this one though!! Not 100% happy with them - I think they are just too plain. love yours as usual. have fun at cha and a safe trip to paris. Here's mine! Emily, THANK YOU for the best time on Sunday nights! I hope that you are ablw to give us a post from paris! You are the best, girl! Have a TON 'O' FUN! Thank you once again for the great challenge!! I love your card, so effective!! Hope you have a fab time at CHA, happy belated Australia Day. I have finally got my bum in gear and got my first card done!! Hopefully I can get the next ones done this week !! Love your card!! Its so bold!! Have fun in Paris!! And at CHA!! yay i love doing those on sunday nights! and i love the way that vaseline technique looks, although i didn't do it on this card. i'll have to try it some other time!